Who invented radio, remote control, alternating current, and many other things? 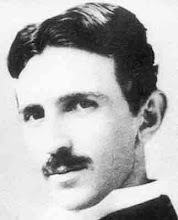 Nikola Tesla! Nikola Tesla and Mark Twain were great friends. Twain paid many visits to Tesla's laboratory. 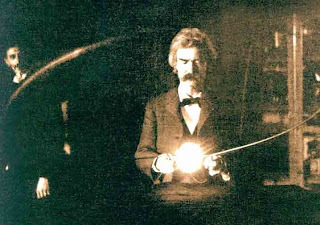 In this photograph from the spring of 1894, high voltage high frequency is being passed through Twain's body to light the lamp. Twain is holding the loop above the resonating coil, and you can see Tesla standing in the background.